The Band is an intermediate/advanced group now consisting of 13 players including a drummer. We play orchestrated music, much of it arranged by Royston Herbert, an ex- musical director. 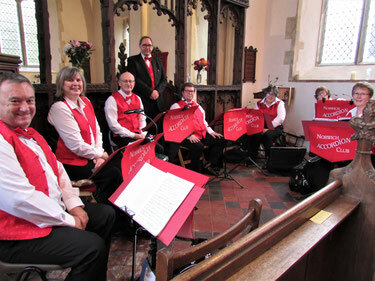 Our repertoire spans a wide range of styles from classical and folk to show tunes and popular music. The band can be hired for a modest fee and we are happy to tailor our concerts to your requirements. As a more advanced accordion group, the Band is looking for existing accordion players or musicians with previous piano/keyboard experience to join us. To contact the Band, please send your enquiry via the Band Contact Page.